When the alarm goes off in the morning, are you excited about your day and can’t wait to jump out of bed? Are you living the life of your dreams and exhilarated with each new day? Or do you find yourself looking at someone else’s life wishing you had what they have? Well let me tell you, nothing could be further from the truth! In our society, we spend entirely too much time comparing our life to others. We look at where we are, see their success, and think we could never do that. The truth is, every success story has its share of challenges. Every successful person will tell you they experienced many mistakes and failures before they began to see their dreams play out. Take Ruth Soukup for instance. Ruth is a wildly successful blogger at Living Well Spending Less and Elite Blog Academy, but she certainly didn’t get there overnight. In fact, it took many, many years of hardship, trial and error, and fighting tooth and nail to get to where she is now. She went through severe depression, dropped out of law school, and she and her husband were at the end of their rope when she decided to start a blog documenting how she learned to better manage their money. At the beginning of her career, she had many naysayers, close friends, and family insisting that she couldn’t do it, but she persevered. She worked her tail off and has now grown her blog into a multi-million dollar business, teaching people how to better manage their money and how to achieve the life they want to live. Or Hal Elrod, author of The Miracle Morning. In his words, he was a mediocre student, and the only record he ever held in high school was the record for the most detentions in any one school year. While in college, Hal started working for Cutco Knives and decided that he was going to break the record for the most knives sold in their 10 day training period. On his first day out, he made zero sales and was ready to give up. Instead, he persevered. He got back up the next morning and nine days later, broke the all-time record. But that’s not the end of his story. A few short years later, he was in a car accident and told that he would never walk again. It was at that point he made a decision that though he couldn’t control what had happened to him, he could control how he lived the rest of his life. Proving the doctor’s wrong, he went on to not only walk again but also beat cancer. Now a successful author and coach, the man has shown that you can go after your dreams no matter what life throws at you. No matter what your circumstances are. It merely takes a change in mindset. In order to achieve anything in life, you have to adjust your thinking. It’s time to realize that no matter what circumstances you’re in right now, no matter what trials and challenges you are facing, you can change your life. You can not only go after but can actually achieve those “oh I’d love to do that one day” kind of life! Absolutely nothing can hold you back! It’s simply a matter of changing your mindset, naming your limiting beliefs, and seeing that they are exactly that. Limiting! It. Is. Not. Too. Late! Change is hard. It means stepping outside of your comfort zone and doing something you’ve never done before. “The more you turn away from your fear, the more you believe that your comfort zone is home and the more time you spend there, the more you become convinced that because you haven’t stepped through fear, you can’t. Limiting belief at it’s best. Comfort zones may be “comfortable,” but nothing big happens inside your comfort zone. It’s time to take that first step toward the boundary of your comfort zone. It’s time to change your mindset and put your limiting beliefs to rest. It’s time for you to realize that you are important, that your dreams do matter, and that you are capable of doing far more than you ever thought possible. Will it be easy? Nope! If it were, everyone would be successful! Change is downright hard. Change will be grueling at times, but a change in mindset is what is needed in order to accomplish anything different in your life and in order to learn how to strategically go after what you want. As Ruth Soukup teaches us in our blogging class, you have to give yourself permission to dream big. You have to stop believing that you aren’t worth it and that you don’t have what it takes. You need to envision a future for yourself that is bigger than how you’re living right now. Without this vision, there will be no reason to go through the pain of stepping outside of your comfort zone. This road is not going to be easy. In fact, at times, it’ll be downright scary. If it’s your true goal, your God-given dream, as difficult as it’ll be at times, it’s going to be the ride of your life. At times when you’re stuck and the enemy is filling your head with his lies, you need that big vision to encourage you to keep going. To be able to push back those lies, and realize that when you’re on to something big, when you’re moving forward in your dreams, he is going to fight hard to make you believe that you aren’t worth it, that you don’t deserve it, that you were silly to even think you had a chance. But if this is God’s purpose for you, absolutely nothing can stand in your way. So give yourself permission to dream big. Allow yourself to go there. Ask God to show you His perspective and His plan for your life. Once you begin to go after the desires of your heart, the reason that God put you on this earth, your going to want it more than anything you’ve ever wanted in your life. It’s incredibly important to make an appointment with yourself to set your goals. Set aside a couple of hours, grab your favorite beverage and notebook, and just start writing. Make sure you have a place where you won’t be interrupted. If you can’t get this at home, then head to your favorite coffee shop, restaurant, or library. Put your phone away and turn off the internet. Start by first writing down all your limiting beliefs. Get them all out of your head and on paper. Is it financial? Health? Young kids? Aging parents? A job you don’t enjoy, but can’t leave? Friends and family members not believing in you? You don’t know how to do something? Do you think you don’t deserve it? Financial: Remember the movie, “The Pursuit of Happiness?” This movie was based on the true story of entrepreneur, Chris Gardner and his struggle of being homeless and how he worked to get he and his son off the street. Not only did he accomplish it, but he became wildly successful. 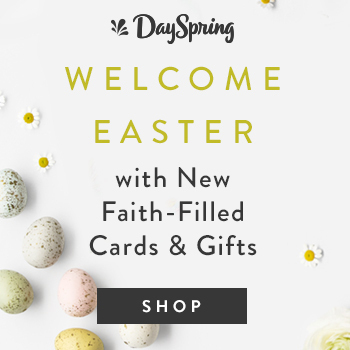 Health: Joni Eareckson Tada was paralyzed in a diving accident and lives her life in a wheelchair and yet, she is making a huge difference in the lives of others. Jen Bricker was born with no legs and yet, she is a successful aerialist. Young kids: I personally know a handful of very successful bloggers who have kids and still running their own businesses. Rather than thinking about how hard it’ll be with young kids, consider what an incredible testimony it’ll be to show your children the value of hard work and what it looks like to accomplish something you’ve worked so hard for. Aging parents: This is certainly a fact of life, but just like anything, you can learn how to plan and schedule your day so that you’re not neglecting your duties to your aging parents, and still going after your dream one step at a time. A job that you don’t like: Change it! Seriously, it’s that simple. I’m not saying you have to run into work tomorrow and give your notice. I’m saying you intentionally schedule your day to go after what you really want. It’ll also require a change in attitude and learning to enjoy where you are right now. You have to provide for your family, so do that with your current job and make a plan to strategically work towards going after what you want. Friends and family not believing in you? That is never going to change. Seriously! No matter what you do in life, there will always be a “Doubting Thomas.” It doesn’t matter. You don’t have to get into conversations with them about your goals and dreams. Their opinion of you does not matter. The only opinion that matters is God’s. The one who created you for a special and specific purpose. Stop letting other people’s opinions control your life! You don’t deserve it. Poppycock! It doesn’t matter what you’ve done in the past or how you’ve lived your life. God put you here for a reason and you deserve to go after that dream and live it. Plain and simple! You don’t know how to do it. Let me just tell you when I started FOI, I knew absolutely nothing about blogging. I was not (and still am not) good at computer and tech stuff. I had no idea there was actually a strategy to blogging. There is an infinite number of resources at your disposal, you can learn from the comfort of your own home, and a lot of those resources are free! So you see, every one of those beliefs is pure rubbish. They are limiting beliefs, mere excuses that are keeping you from going after the desires of your heart. After you write them down, take a red pen and mark a large letter “X” over every one of them. They are simply a ridiculous excuse for why you think you can’t live the life you want. Now that there’s nothing stopping you, you are wide open to dream big! Brain dump – Brain dumping is simply getting everything out of your head and onto paper. Don’t set a time limit. Don’t censor yourself. Just keep writing until everything is out. Nothing is too big or too silly. As you’re writing, don’t ask yourself “how.” It’s a very important question, but not right now. Set aside all your circumstances (limiting beliefs) and dream as if all the stars were aligned and nothing was holding you back. If I could have absolutely everything I ever wanted, what would it be? What does my dream life look like? Get specific. Where would I live? What would I like to be doing? What’s my dream job? In five years, where do I want to be? Need some more help to get your creative juices flowing? Would you like to become debt-free? Do you want to volunteer at one of your favorite ministries? Do you love to travel? What burning desires have you always had, but keep pushing down because the circumstances aren’t right? At the end of the day, what would you like people to consider when they think of you? If you were to pass today, how would you like people to remember you best? Remember, go big or go home! Nothing is too crazy. Nothing is too bizarre. Anything and everything is possible. Once those limiting beliefs are out of the way, do you see how all of a sudden it opens your mind to the fact that you can actually go after those dreams? Achieving your goals is not going to be a quick road. It’s going to require a change in mindset, take time to learn new things, and will stretch you beyond anything you’ve ever done before. But my friend, it’s going to be incredible! You’re going to learn how capable you truly are. 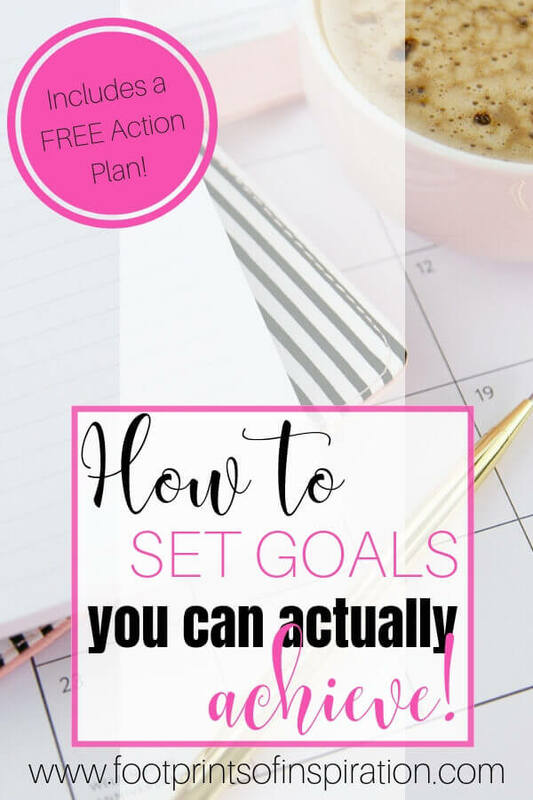 I know that going after your dreams can be a very daunting task and requires a strategic plan, so I’ve put together a FREE printable, The Goal Crushing Action Plan, to help walk you through the process. It can be found in our subscriber library. Simply fill out the form below to subscribe and get instant access to all our FREE resources. We’re talking about the rest of your life, so pray about it and spend some time considering what you really want. 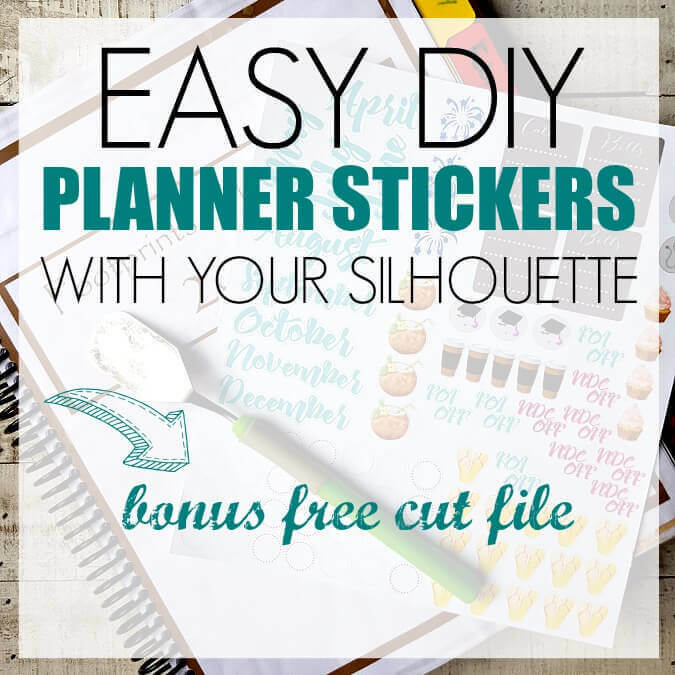 After you’ve completed your brain dump, I’d love to hear some of your goals! Post them in the comments section below or email me at tammy@footprintsofinspiration.com. I’ll pray for guidance and cheer you on! I’m telling you, living out your God-given dream is like nothing you’ve ever done in your life. It’s exhilarating, it’s fun, and it makes you excited to jump out of bed in the morning! So go out and get it, my friend. You deserve it. Thanks for stopping by the blog today! Be sure to sign up for our newsletter so you don’t miss a single post! P.S. 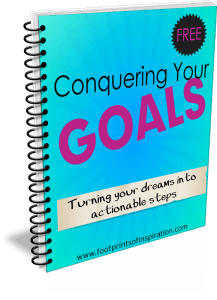 Need a step by step strategy for turning your dreams into attainable goals? 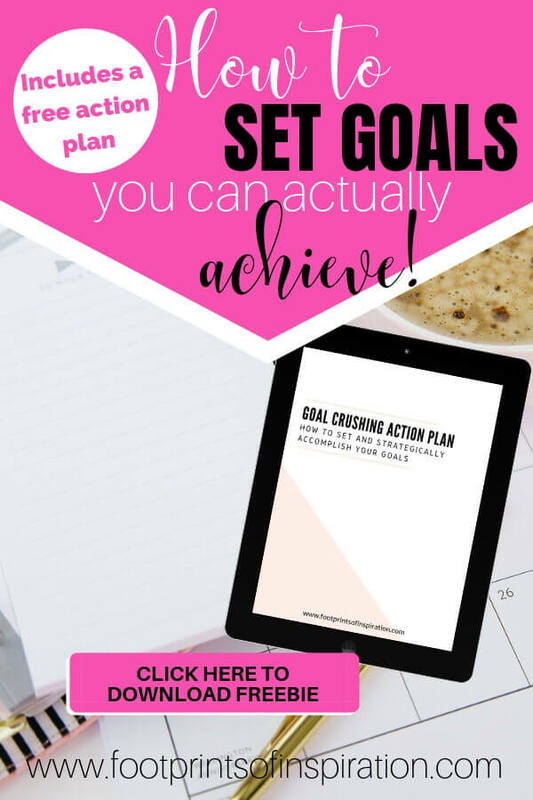 Enroll in my free e-course below, Conquering Your Goals – Turning your dreams into actionable steps and get started today!